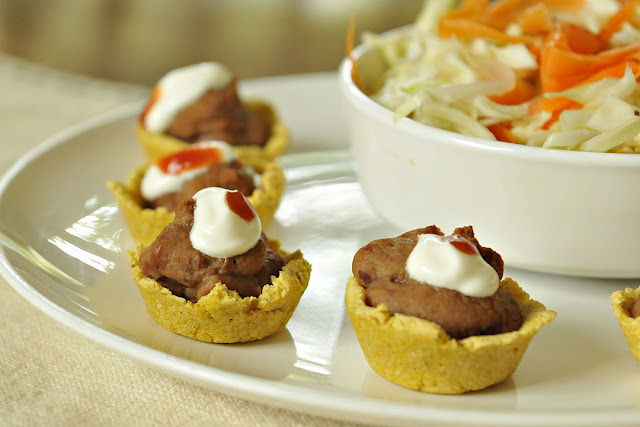 The corn cups served with cole slaw. 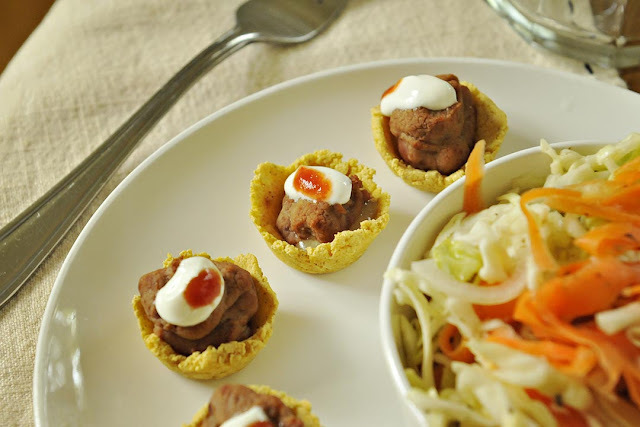 The other night I was browsing through my recipes and found one for Pupusas with Curtido. I think I clipped this recipe because it was made with masa harina. I am always looking for "flour" type recipes that actually do not include wheat flour. Corn has been something that I can tolerate and so this recipe caught my eye. I did get an idea. 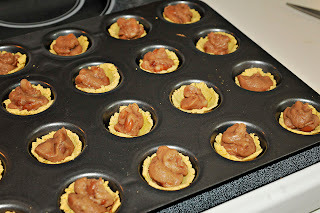 You may have remembered an earlier post where I had talked about buying a mini muffin pan at Goodwill that was from Pampered Chef (this was such a good deal), well I thought how cute little mini masa harina cups would be filled with something yummy. I was nervous, I did not even know if the masa harina would bake, let alone hold up into any shape once it cooked in the pan. I baked them for 15 minutes and they popped right out of the pan in these cute little cups. I used a baggie for the beans and the sour cream. 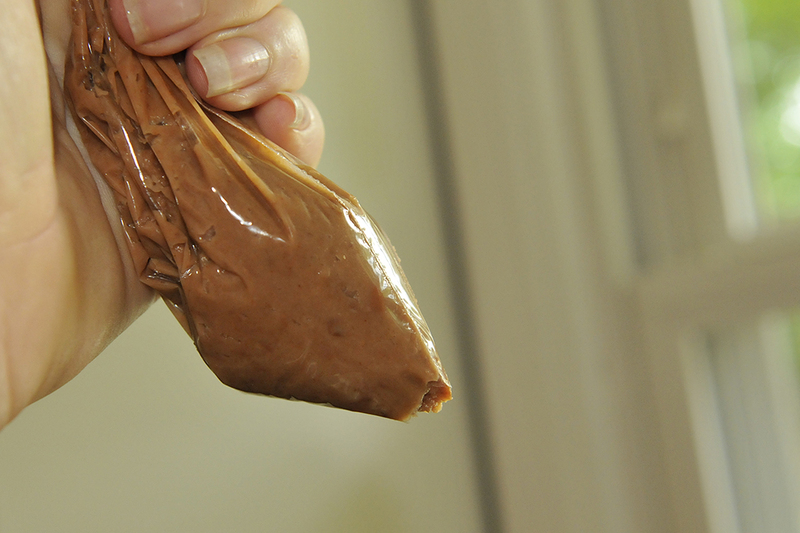 I grabbed a can of refried beans and cheese. Filled each cup and baked again for 5 minutes. The "oh-so-cute" little cups were delicious. 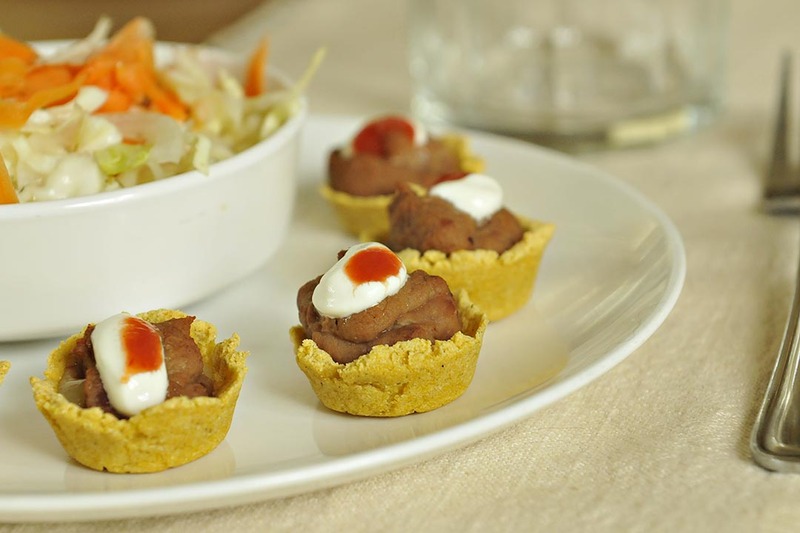 AND, that is how I came up with this fun appetizer, lunch or dinner recipe. Mix all ingredients together. Let dough rest for 30 minutes or put in the fridge for a few hours. Take your non stick mini muffin pan and add a small amount to each spot. I used my finger to work the dough around the edges and up the sides. If the dough is not refrigerated it may stick to your fingers. You can use flour or GF flour to help with this, if you are in a hurry. I baked the cups at 400 for 15 minutes, added my filling and rebaked for 5 minutes. The cups will continue to get crispier as they sit. I would not recommend over baking these or they may get too hard. I added refried beans and cheese. Instead of grating the cheese, I sliced it and cut the cubes into sizes that would fit into the bottom of each cup. This prevented me from having shredded cheese everywhere. I then added the refried beans. Baked for 5 more minutes. I place sour cream into a baggie and added a small dollop to each one. I used a spoon to drip the hot sauce as an added bonus and for some color.